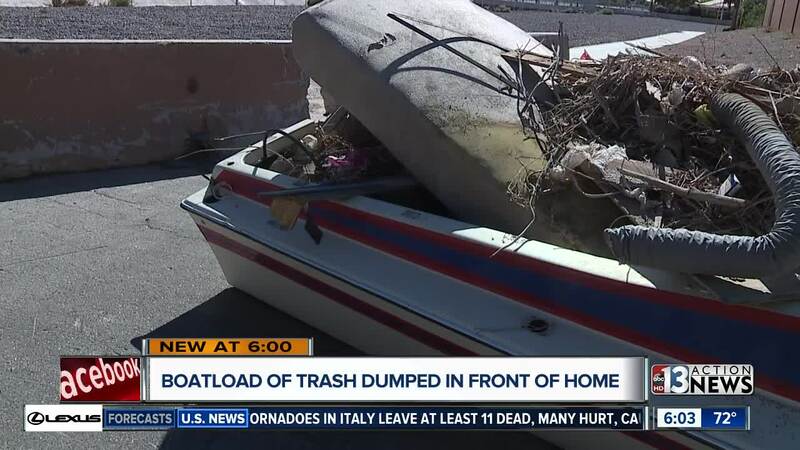 A neighborhood in east Las Vegas is dealing with a boat-load of trash, literally. Someone drove up, dropped off a boat filled with trash and rotting food, and drove off. Adessa Bratton just happened to look outside her window, and catch the whole thing happen. "I was like, okay it's full of trash. It literally has raw meat in it. It's been completely gone through. There's no engine there's no anything. I was just shocked. I couldn't believe that's what happened,"
After the shock wore off, the question turned into, now what? First thing she did was call police. Officers came out, and tagged the boat as an abandoned vehicle, but that is a 3-day process. The next step was to go to Clark County. Bratton says spoke to multiple people over the course of 24 hours. Essentially, she was told since the boat wasn't on a through street, it wasn't affecting traffic, and it wasn't a priority. "I'm not touching it the meat. I'm not touching the trash. It's disgusting. It's Halloween tomorrow so i don't want kids to get curious and think we can climb on it," Bratton told us. At this point, 13 Action News had to get involved. We called Clark County a few times, but eventually we got results. Bratton called us to say they were out there, cleaning up the mess.